As I was walking down the busy streets of London, walking fast passing through the flood of busy people trying to get somewhere; I smelled it. Where was this scent coming from? As the lady passed me, I smiled and told her “You smell of home” She smiled back and padded my shoulders. As we both went our spate ways, I inflated my lungs with the aroma. What I smelled was Bukhoor. It’s one of the distinctive traditions in Yemen. It is a mixture of natural traditional perfumed scents made of Oud (Agarwood) soaked in fragranced oils mixed with sandalwood, musk and other ingredients. Each Bukhoor maker cooks his Bukhoor in his own way keeping his recipe a secret. Some of these recipies are hundreds of years old. There is no particular way to make it, they get creative in mixing different exotic scents in order to stand out. ‪ In Yemen the profession is hereditary, makers inherit the art of making Bakhoor from their great ancestors and it passes from generation to generation. A box of Bukhoor will contain little uneven rocks, that release a thick white rich smoke carrying the scent ; spreading it into the air. I grew up with the smell of Bukhoor waking me up every Friday. My mother would bakher my father’s clothes before he went to for prayers. She would then place a mabkhara in every cupboard, and our clothes would smell amazing all week. Due to the physical nature of Oud, the smoke clings to anything it’s exposed to, making the smell lasts longer. You will also find it in special occasions (big parties, weddings…etc.). As you are sitting down, someone would pass around the guests with a mabkhara, and each lady would sweep the smoke towards her with her hand. Traditionally, it’s also known to have great power, in creating a romantic atmosphere in bedrooms *Wink Wink* . It’s considered a man magnet, and is used in some shops to attract customers. The older generation thinks that having Bukhoor in the house kicks out evil spirits. 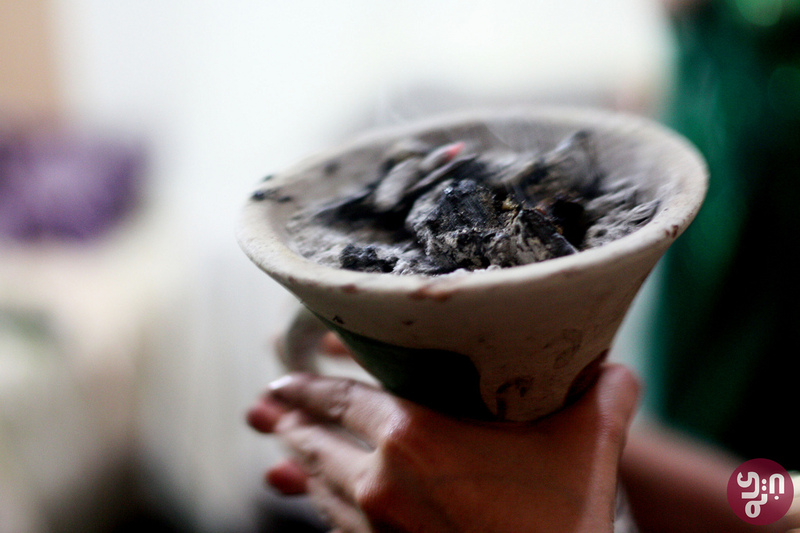 Bakhoor has been used for thousands of years for religious and social rituals. It’s evident in Islamic history, as it’s known that prophets have used it. When Queen Arwa ruled yemen, every Ramadan and Muharram, the scent invaded the streets Egypt and Iraq and the people knew that gift from Yemen has arrived. Through history burning of fragrances has been known to be healing for the soul, but even biologist found it to have an effect on the brain. It’s a scientific art as each ingredient has a different psychological effect; different of Studies showed that the scent can enhance memory, boosts energy, and helps the brain to concentrate. For me: I smell home, my mom, and my culture. If you would like to try it, let me know, I’ll supply you with Bukhoor, and all you’ll have to do is light it up! This entry was posted in Yemen and tagged Bakhoor, Bukhoor, Customs, Gulf, Tradition, yemen by sousalz. Bookmark the permalink.